I normally don’t do outdoors bouldering. 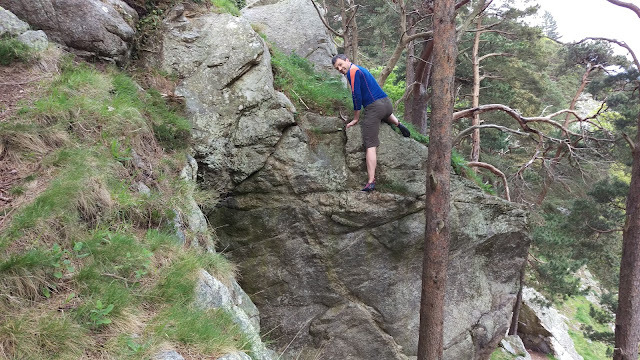 As a matter of fact I don’t think I ever climb a boulder outdoors (Ivy Chimney counts?). We’ve decided yesterday that we just going to go and check out The Scalp today. 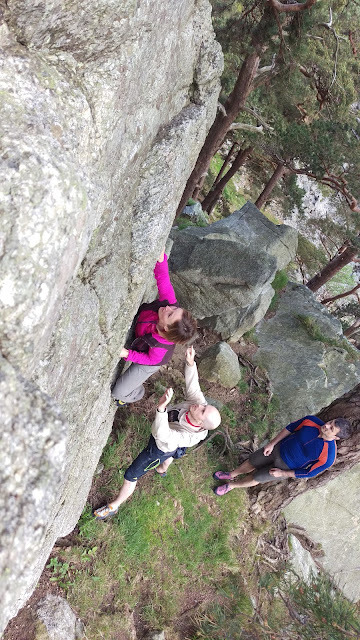 Excellent guides are available on climbing.ie wiki & dublinmountains.ie, so I won’t get into details of how to get there (other than the fact, that’s it literally around the corner from where we live). Monika and I arrived just before 5pm and were promptly joined by Andrew and Louis. The plan was simple – explore the area and maybe even climb something. We’ve ended up checking out some of the easier problems, with the most fun being The Tree Chimney. It’s kind of funny, that even problems graded 5 suddenly are much more challenging, when the only pro you have are the hands of your spotter. We continued up the hill, attempting various easier problems, and ended up on the very top looking at Dom’s Wall. It’s a highball face with apparently good holds. Monika went highest, but also eventually climbed down. It wasn’t worth the risk of breaking ankles.